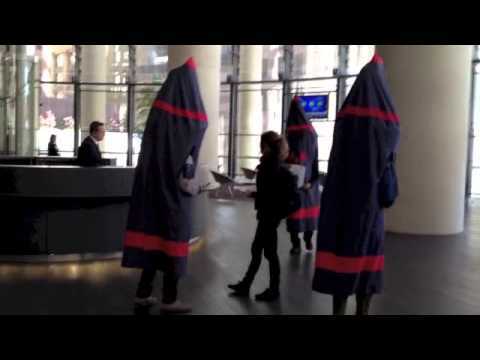 On August 9, 2013, Future Fund CEO Mark Burgess encountered some unexpected visitors at his Melbourne office. A group of about 20 protesters gathered outside his office doors, some dressed from head to toe as nuclear missiles, before being escorted away by police. The human missiles turned up again a few weeks later at the fund’s Sydney office, demanding answers about its investment portfolio, which includes nuclear weapons. The protesters were drawing attention to the fact that the federal government’s $101 billion Future Fund invests more than $260 million in foreign companies involved in the manufacture of nuclear weapons (and that figure has increased by $33 million since last June). “There are clearly many different views on what should be invested in, but the Future Fund takes a disciplined approach to considering exclusions that reflects best practice,” a fund spokesperson told The Saturday Paper. The Future Fund’s nuclear weapons investments only came to light in 2011 when Tim Wright, director of the International Campaign to Abolish Nuclear Weapons (ICAN) Australia, issued a series of freedom-of-information requests that uncovered the investments. According to Wright, the Future Fund argues that the investments are justified because the nuclear non-proliferation treaty (NPT) doesn’t establish a ban on nuclear weapons. “They say they are taking a disciplined position, but it’s hardly a disciplined approach to exclude tobacco, landmines and cluster munitions, but not nuclear weapons. The fund argued that, given the lack of a global prohibition on nuclear weapons, it was perfectly legitimate for them to invest in these weapons,” he says. However, Australia’s Future Fund is a relatively small player in the global trend that has seen 411 international investors making an estimated $US402 billion available to the nuclear weapons industry since 2011, either as investments or loans. These figures are contained in the report “Don’t Bank on the Bomb”, released earlier this month by Dutch peace organisation IKV Pax Christi (PAX). It details how Australian banking institutions, including ANZ, the Commonwealth Bank, Macquarie Group, Platinum Investment Management and Westpac, have financed an estimated $US4.6 billion for nuclear weapons producers since 2011. The money is used to modernise old nuclear warheads and assemble new ones, build missiles and launchers, and update the technology that supports them. While most of that money comes directly from taxes collected in nuclear-armed countries, private-sector investors and banks from non-nuclear-armed countries (including Australia) provide the missing financing to maintain nuclear arsenals. ANZ and Westpac have both provided sizeable loans (totalling more than $US200 million) to Honeywell International, a US company that manufactures components for nuclear weapons, as well as being involved in tritium production and the life-extension program for the US Navy’s Trident II nuclear missiles. Westpac has also made $US380 million in loans available to companies such as Boeing, the manufacturer and now maintenance supplier of the US’s Minuteman III nuclear intercontinental ballistic missiles arsenal, and URS, which manages US nuclear weapons facilities such as Los Alamos National Laboratory and provides electronics systems support for the Trident missile program. A Westpac spokesperson referred to the bank’s “Financing the Defence Sector” policy, which states: “Westpac will not provide direct financing for controversial weapons.” The policy further notes that these “include those weapons which are banned by international arms control treaties ratified by Australia, such as cluster munitions and anti-personnel landmines”. On August 28 this year, Greens senator Scott Ludlam put a number of questions on notice to the minister for finance, Mathias Cormann, on the question of the Future Fund’s nuclear weapons-related investments. Although the fund is governed by an independent board headed by former treasurer Peter Costello, Cormann is ultimately responsible and the fund’s investment decisions are not always free from political interference. For example, Labor health ministers Nicola Roxon and Tanya Plibersek were influential in the Future Fund’s 2013 decision to divest from tobacco stocks. Ludlam says these types of investments point to a bigger failure around the way markets are currently structured. “Investment decisions need pay no heed whatsoever to human welfare or risks to the environment. They operate in a complete moral vacuum,” he says. In 2009 in Prague, US President Barack Obama raised the hopes of the global disarmament movement by vowing he would take “concrete steps towards a world without nuclear weapons”. It proved to be a hollow promise – the US has in fact increased its military spending under the Obama administration to about $US600 billion annually (more than three times China’s defence spending and more than six times Russia’s, and about 40 per cent of the world’s total defence spending). However, as we have seen recently at the G20 in Brisbane, while climate change is rightfully recognised as the key threat facing the survival of the planet, a growing number of international governments are starting to raise the issue of divestment from nuclear weapons. In February 2014, more than 140 governments, including Australia’s, participated in a conference in Mexico to discuss the humanitarian impact of nuclear weapons, with many countries calling for a global treaty banning them. Former prime minister Malcolm Fraser has joined former senior US defence and government figures including Henry Kissinger, George Shultz, William Perry and Sam Nunn in calling for the complete elimination of nuclear weapons. “I believe nuclear weapons don’t add to the security of any country and they make every country less secure,” Fraser said. While he allowed that investment in companies involved in nuclear power for peaceful purposes could be acceptable, Fraser said he would like to see Australia divesting from companies solely involved in nuclear arms. He sees it as part of a larger question about defence policy.